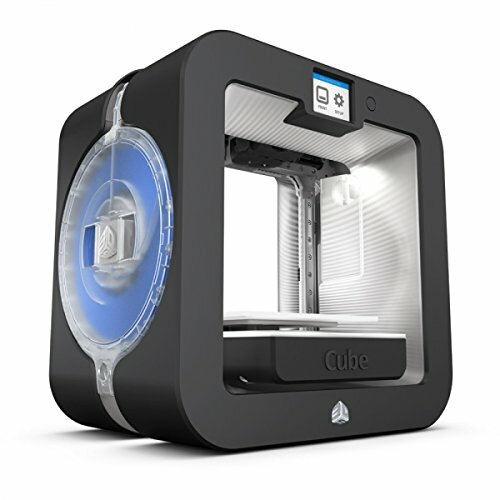 The Cube 3D printer brings your creative projects to life, building dual-color objects on a print platform that stays cool throughout the process. Wireless connectivity and a color touch-screen let you transfer a project from your computer or smartphone to your printer with ease. Take the printer out of the box, and with the snap and load smart cartridges, you can be printing in minutes. These cartridges keep your filament fresh and communicate with your Cube so you don't have to. It tells your Cube which material settings to use and how much filament is left, so you never run out mid print. Safe for the classroom-Cube is recommended for children 8+ and meets IEC Home Printer Certification 60953 (TUV). Dual extruder prints in 2 colors and multiple materials, including PLA, ABS, and Infinity Rinse-Away support material Allows printing of designs up to 6"H x 6"W x 6"D Print your designs wirelessly from your PC or mobile device using the free Cubify app Fast, easy set up with an integrated color touch screen that guides you through the set up and printing process Prints in two resolutions: 200 microns for standard resolution, or 70 microns for high resolution. Designed to fit your lifestyle, the Cube offers an intuitive color touchscreen UI for wireless and on the go printing that is 2X faster than other printers. Preloaded filament jets and an auto-calibration feature for high-resolution 70 micron printing ensure beautiful, effortless results every time.